Here is yet another resin kit I picked up at this year's 2018 Jersey Fest called “Galaxy Queen”. 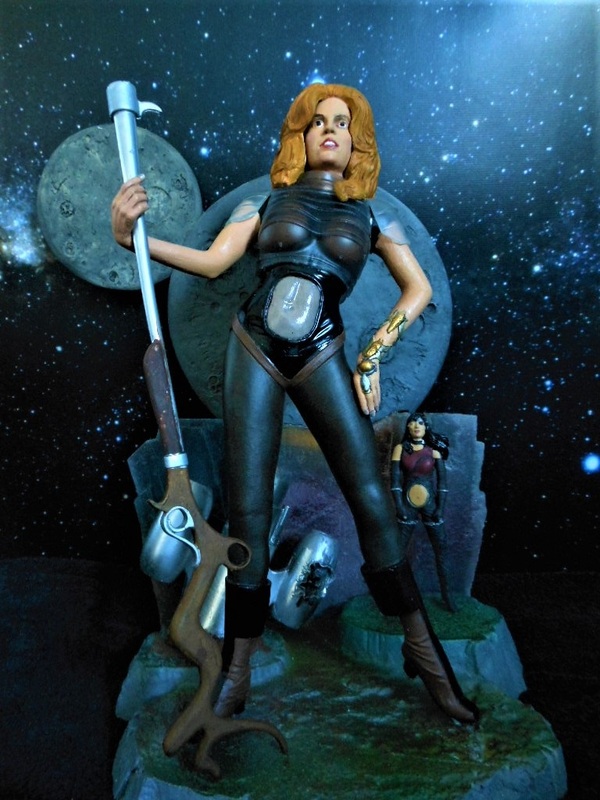 It is, in fact, a sculpt by Robert Price based on a publicity pose for the 1968 sci-fi spoof “Barbarella”. I imagine the manufacturers renamed the to kit to avoid any copyright infringement issues but a cursory search on Goggle will provide a duplicate pose by the comely Jane Fonda who played the titular character (see photo at the bottom of this page). In any case, the kit is interesting in that aside from the charms of Ms. Fonda, it also features several other items of interest, namely a roughly quarter scale crashed spaceship and 'The Great Tyrant', another female character in the film posed in the background. 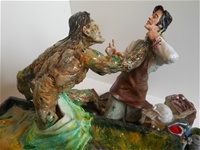 The base is fairly plain affair but the background is also cast in a semi-transparent resin upon which are mounted a pair of moons which present a lot of creative possibilities. 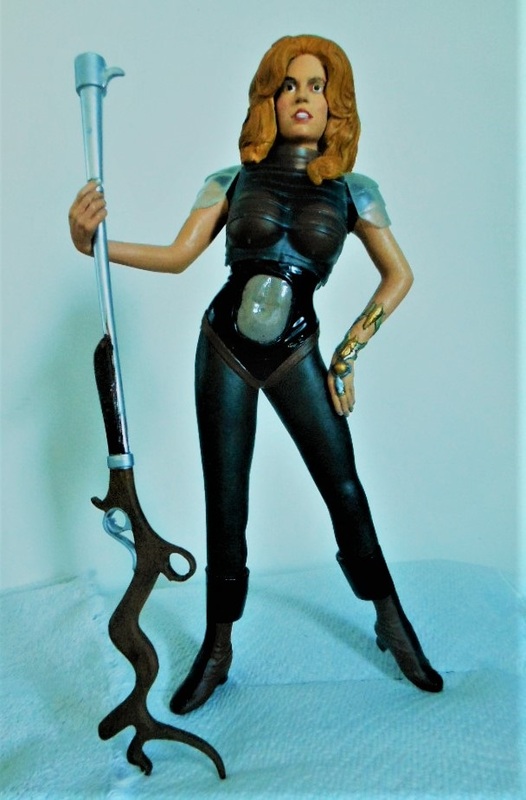 I was toying with the idea of using actual nylons stockings on the Barbarella figure but after several relatively inexpensive purchases on eBay of doll stockings, I pretty much gave up since they were either too small or too large for the figure. I ended up painting her legs Van Dyke brown which came pretty close to the look I was aiming for. In case you are wondering, I tried tinting the flesh colored paint I used for thr rest of the figure but I kept ending up with an odd grayish purple mess which just wouldn't do. Assembly was pretty straightforward although the plastic 'corset' and shoulder pads were a bit unwieldy. After mucho repositionings and finally figuring out that a few of the protrusions on the clear castings were to be cut off, they parts finally fit pretty well. Publicity still for the film. Click once for a larger version. My take on the same pose. Click once for a larger image.